I want to give an early warning: if you don’t like your heroines to be F-bomb dropping maestros who make questionable choices while drinking enough liquor for a fleet on leave, Mr. Right-Swipe might not be the summer read you’re looking for. It’s not a small-town series with quirky but loveable characters who achieve a happy ending without too much fanfare. No, it’s grittier than that, but because it is a chick-lit novel, it does have raunchy slapstick antics and PG-13 rated I Love Lucy type shenanigans--and they’re pretty funny. The main character, Rae Wallace, is a 34 year old divorcee who’s been burned by love so often, she would sooner to be skinned alive than go on another date. (Preach, sister!) However, one of her BFFs, Quinn, is getting married a second time, and in true bridezilla manner, informs Rae she will be bringing a plus one to the event, even though it’s only about six weeks away. The plan? To use the Spark app (read: Tinder) and the girls get together on a wine date and help Rae right-swipe a number of prospects for future dates. Rae, they say, is too picky, too harsh with men. Her divorce and her breakup with a love interest, Jesse, have made her mean and closed off. Fine. So it begins with five acceptable right-swipes and the dating begins. Meanwhile Rae does have a job--and at work, she meets Hot Sub Guy, Nick. At work, she and Nick share the kind of fun witty banter and chemistry of Jim and Pam from The Office. Of course, according to the rumor mill, Nick is attached, thus Rae is stuck with these dates from hell. In between work and dating, Rae is also helping with the wedding and the continued amped-up tension of a Bride On The Edge will make you very very glad you’re already married and don’t ever have to do any of this crap again. Finally Rae meets James who is perfect. He’s charming, romantic, kind, and he cooks! He doesn’t try to force intimacy on her. They snuggle on the couch and watch Netflix. 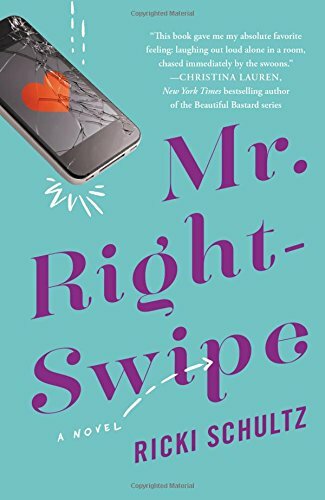 After a flurry of bad dates, Rae has finally met a man who makes her eat her words about online dating--and he’s agreed to come as her plus one! Her friends are very excited. And then James “ghosts”. It’s a week before the wedding and he won’t return phone calls or texts or emails and it is quite clear she no longer has a date for this wedding. The wheels are officially coming off the wagon, and the ladies have a discussion over lunch. The fight to end all fights in the school lunchroom. Oh, boy, have we all been there. Don’t you love it when your friends basically tell you they don’t like you anymore, their significant others hate you, and they don’t want you in their wedding? Fortunately, the author is able to turn all this angst around and secure us the happily ever after we all deserve, but it feels like it will be impossible. I cried a little in relief in the end, but I didn’t exactly have the post-book swoon of knowing everything was going to be HEA and wanting to re-live some of the more dramatic scenes. Once was plenty. So here are my pros of the book: 1) the funny scenes are hysterical; 2) Nick is oh-so-dreamy and lovely; 3) good solid writing, especially the dialogue. About halfway through the book, as I was vacillating between whether I liked this book or not, I decided I did enjoy the author’s writing ability. It was very skilled. And that perhaps my lack of love for most of the characters (save Nick) was because the characters I didn’t care for were people I knew and had exactly that sort of interaction with. I am the perpetual single who “hates men” and my friends tend to have the long marriages with quirky husbands that I, like Rae, don’t know how they do it. I’ve met some bridezillas; I have been that bridesmaid. Perhaps the reason I loved Nick best was because he was the most fictional character of the lot. So that said, real authentic characters and dialogue, if your book choosing goal is something warm and fuzzy and cozy, I don’t think this is quite that book. It’s funny and painful and bittersweet. I loved Trainwreck and Bridesmaids, but I don’t own either movie because the main characters are a little too unlikeable and the drama is a little too real for me. If you miss your share of chick-lit novels, women who aren’t afraid to be real, and the good old days of being someone’s bridesmaid, this book is right up your alley. Thank you!! Thank you for giving me a forum to post!! I love your reviews too, Hellie. I can "hear" your voice.